The Predators are barreling their way through one milestone after another this season. A week ago, Preds goalie Pekka Rinne became just the 34th goalie in NHL history to record his 300th career victory. Any day now, the Predators’ David Poile will pass Glen Sather to become the winningest general manager in NHL history. But perhaps the most stunning memorable moment will occur later this month. 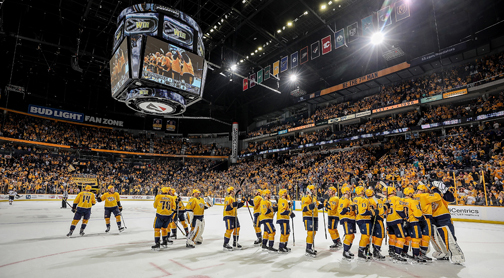 That’s when the Predators – if all goes according to form – will record their 100th consecutive home sellout. 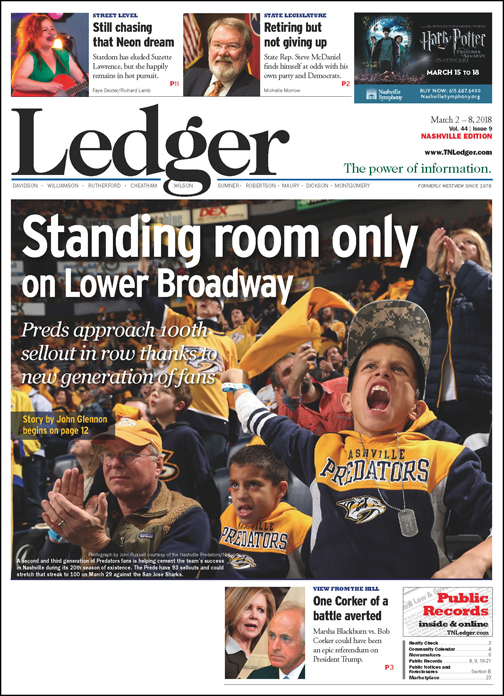 The streak, which has spanned parts of three regular seasons and two postseasons, hit 93 last Sunday when a standing-room only crowd of 17,523 squeezed into Bridgestone Arena to watch Nashville down St. Louis 4-0. “We’ve got a sellout wall in our office, and every morning of a sellout we have a little ceremony – the whole staff gathers around, the bells go off and everyone claps,” says Sean Henry, the Predators’ president and chief executive officer. Indeed, hitting 100 consecutive on the sellout streak is impressive enough on its own, but the number takes on even more significance given the struggles this franchise once had in filling the building. Poor home attendance almost cost Nashville its team a decade ago. And, as recently as the 2009-10 season, the Predators still were averaging less than 15,000 fans per game. But Sunday’s crowd against the Blues meant the Preds have averaged 17,249 fans per contest this season, which is actually more than the building’s capacity of 17,159. No current Predators player can appreciate the change over the years more than forward Scott Hartnell, whose first stint with Nashville began in 2000-01. It ended in the summer of 2007 when Hartnell was traded to Philadelphia. Poor attendance had led former owner Craig Leipold to slash his payroll before selling the team. Hartnell re-signed with the Predators last summer, so he’s yet to see a home crowd this season that wasn’t a sellout. Another sellout crowd celebrates along with the Nashville Predators following their 4-0 win against the St. Louis Blues on Sunday. “My first time here, this was not a stable franchise – there were always rumors that it was going north of the border,” Hartnell recalls. “There were plenty of games in the early 2000’s where the building looked like it was only half full. But now it’s jam-packed and full of energy. It’s worth pointing out a couple distinctions regarding the sellout streak. First, the NHL has no strict definition of what a sellout is, so individual teams are free to use a combination of tickets sold and tickets “out” – complimentary tickets – to count toward the attendance for any given game. The Predators do usually have some tickets available on game days, which come from three sources: Broadcasters release whatever seats they won’t be using that day, as do Predators’ players and the visiting team. Second, Bridgestone Arena’s capacity of 17,159 is one of the smallest in the NHL, far below the likes of traditional clubs like Montreal (21,288 capacity), Detroit (20,000) and Chicago (19,700). So, the Predators don’t need as many fans as most other teams to produce sellouts. Still, the fact the Preds are now selling concourse passes and standing-room only tickets is evidence that ticket demand continues to grow. The Tennessee Titans have seen their attendance figures rise in each of the past two seasons, though the team hasn’t announced any sellouts over the past three years. In 2017, the Titans averaged 65,652 tickets distributed per game, up from both 2016 (64,659) and 2015 (62,307). The Titans’ two biggest crowds last season were for Seattle (69,127) and Oakland (69,089), both of which neared the listed LP Field capacity of 69,143. Two other home games – Baltimore and Cincinnati – had more than 67,000 tickets distributed. Tennessee at one point had claimed a sellout streak of 164 straight home games, stretching from 1999 through 2014. But that streak was tainted when a NewsChannel 5 investigation revealed the Titans had an agreement to sell large chunks of unused game tickets to a scalper. The streak officially came to an end during the first preseason game of 2015. 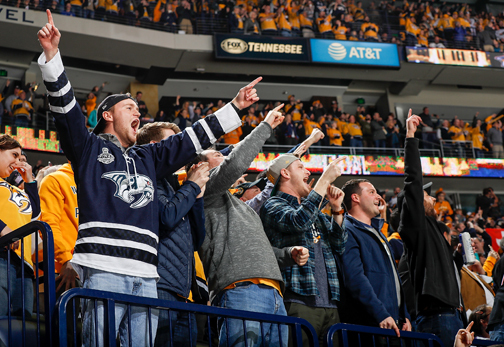 The Predators have pushed past capacity for more than half their games this season, including the franchise record crowd of 17,561 that watched Nashville down Detroit on Feb. 17. “When Nashville came in the league, who would you have predicted those kinds of crowds?” Predators forward Austin Watson asks. So just how have the Preds gone from a franchise that averaged as few as 13,157 fans per game (in 2003-04) to today’s ongoing sellout streak? The transformation first began back in 2007 when local investors purchased the club from Leipold, who’d lost more than $50 million in his eight years. When the new investors chose to hire Henry and former CEO Jeff Cogen in 2010, the attendance figures really began to increase, jumping from an average of 14,979 in 2009-10 to 16,142 in 2010-11. Success on the ice and subsequent expectations have played a role as well in recent years. The Predators produced one of the best records in the league during the 2014-15 season, advanced to the second round of the playoffs in 2015-16, reached the Stanley Cup Final last year and are near the top of the NHL standings again this season. Nashville Predators fans erupt after a game-tying goal late in the third period of a game against the St. Louis Blues earlier this month. So, a much-larger season-ticket base means not nearly as many individual seats have to be sold to reach sell-out status as in past years. Henry sees the maturation of the fan base making a difference, as well. “We’re 20 years old now, so now you’re turning the corner on that second generation of fans,” Henry adds. “Now you have a 25- or 26-year-old young lady who was 5 years old when she came here. She doesn’t know anything different than the Preds being her team – her brand. This is where she has to be. The 93-game home sellout streak, which began April 2, 2016 in a loss to San Jose, certainly appears to have boosted the Predators on and off the ice. Nashville has produced a record of 61-20-12 at Bridgestone Arena during those contests, including a 13-4 mark in home playoff contests. The team’s regular-season home record during that stretch is 48-16-12, which means the Preds are third-best in home points (108) among the NHL’s 31 teams – trailing only Pittsburgh and Washington. Predators players say their big home crowds are especially noticeable on games early in the week, which traditionally don’t draw, as well as games later in the week or on weekends. “A lot has changed since I first got here,” says Predators defenseman Ryan Ellis, who was drafted by Nashville in 2009 and made his NHL debut in 2011. “When I first started, Tuesday night games weren’t much of a hit here, which is understandable because sometimes they’re tough for people living outside the city. We might have 14 or 15 thousand fans. The bigger crowds almost certainly played a role in Forbes Magazine estimating the Predators’ value at $380 million in late 2017, a 41 percent increase – third-highest in the league – from the publication’s estimated value of $255 million in 2016. The Titans were valued at $2.05 billion, a 2 percent increase from 2016. Forbes’ most recent figures also estimated the Preds’ revenue stream at $141 million, 13th-highest in the league, which has helped the team lock down all of its top players with multi-year contracts. It goes without saying that advertisers and sponsors are more likely to hitch their wagon to teams that can virtually guarantee sellout crowds, since they know their products will consistently be seen by plenty of eyes. “I’ve always said that until you sell out the building, nothing else matters,” Henry explains. “Your business can’t grow around a building that’s not maximized. And when potential new ticket-buyers know that very few tickets will be available for most home games, it tends to make them a bit more decisive when taking the plunge themselves. “Now that games are sold out, there’s an urgency to take action, whether it’s to renew or buy now,” Henry adds.